If you’ve read my previous article then you know that I’m a big fan of Autodesk SketchBook Pro and its many variations. This summer a new version has appeared which introduces new features and a new licensing scheme which cleans up the jungle of SketchBook versions – at least on your desktop. Or so you’d think. Meet the new and improved Autodesk SketchBook, sometimes called SketchBook Pro 7. It even has a new icon that sets it apart from the mobile apps – which may change soon, depending on the companies other plans. In this article I’ll tell you the major differences between your many buying options so you can decide which one is best for you. I’ll also give you a quick overview of what’s new and if it actually makes sense to upgrade at all. If you don’t have an account, or you’re not logged in, you’ll have access to the same features that you had in SketchBook Express: six standard brushes, six colour swatches and a colour picker and no layers. It’s pretty basic, but it lets you test drive the engine and the interface and see if you like it. But it works without the need for an account (unlike Adobe Creative Cloud products). Logging in with a free SketchBook account (with your Autodesk ID or your favourite Social Network’s credentials) you get access to the “Essentials” features: those are more brushes, including blenders, a variety of Copic colours, 3 layers, the famous selection tool and a few other bits. This is similar to the previous SketchBook Copic Edition and is a great tool to have for free. The team have done a great job integrating all the above into the same clean interface as in the previous version, combining related commands (like the shapes tool) into a single icon which opens a second menu where necessary. If you’ve used SketchBook Pro 6 you’ll feel right at home. The new SketchBook is 64 bit compatible which makes it run a little bit smoother on compatible hardware. I’ve noticed this even on my 3yr old Mac hardware. It’s not major but a nice addition – available in all editions, not just Pro. You can buy the software outright via a proprietary license just like before, either as a single Mac/PC disk for $65 or a download. Amazon have it on special offer sometimes ($49 at the time of writing). This is for the full version of SketchBook Pro 7. You can also buy an Upgrade from previous versions from the Autodesk site for $45 (download only). This upgrade has not appeared on Amazon yet. Subscriptions are linked to your SketchBook account which allows you access on both Mac and PC – switch platforms as you please, even if you’re working on someone else’s machine. Autodesk have introduced an option for everyone here: I’m currently on the $2.99 per month plan to test drive the new features, and I love the flexibility: $2.99 is less than a latte at Starucks, cheaper than an iPad app and I can drop the subscription anytime I like (it auto-renews, so don’t forget to cancel if you’d like to make use of this feature). My creative drawing muse only visits every few months and don’t need access to the Pro features at all times. Note that there is no “trial version” anymore – so you don’t get to use the Pro features for free for a limited time as you could before. There is however a field for a “coupon code” upon checkout, which suggests discounts or options for a “free trial month” somewhere down the line. This is always a tough question for me: if you already own SketchBook Pro 6, is the upgrade to SketchBook Pro 7 really worth it? Well the good news is that both versions can peacefully coexist on the same machine: SketchBook Pro 7 is a new executable that installs itself alongside SketchBook Pro 6. And at the time of writing they both work equally well. If you don’t need the new features, and Pro 6 works for you, then use it for as long as it works on the current OS (Mac Mavericks / Windows 8.1 at the time of writing). SketchBook Pro 6 however won’t receive any new updates, so if a newer OS breaks the software, I doubt that Autodesk will fix it. For example, SketchBook Pro for iPad does not currently work with the Developer Beta 5 of iOS 8 – a similar fate may befall Pro 6 for Mac with the arrival of Yosemite, and perhaps even with Windows 8.2. Thanks to the new licensing options though, you can keep SketchBook 7 installed on your machine and dip in-and-out of those new features as and when you need them. 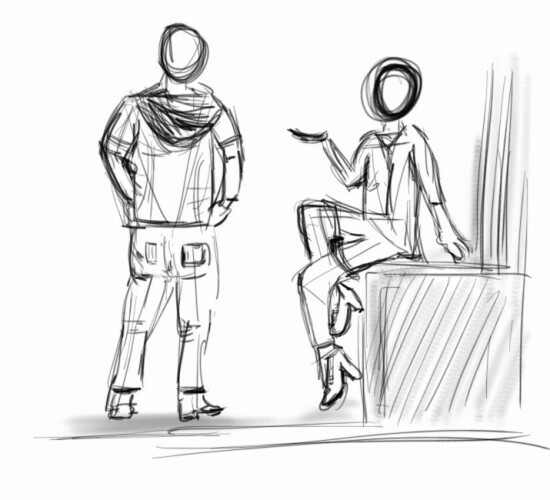 Perhaps you didn’t know how cool animations inside SketchBook could be? Or maybe those perspective rulers turn out to make you a better artist. Or maybe you don’t need any of those features – in which case stick with what you have (Pro 6). I will say that Sketchbook Pro 7 is a little bit faster due to its 64 bit libraries. It is noticeable, but really only when compared side by side. I can feel a minor difference both on my Mac Latop with a Wacom Intuos 4, as well as the Surface Pro. But as I said, this is small. Try the free version and compare. I always thought that SketchBook Pro was a little overpriced for what it was – considering cheaper products like Manga Studio 5, which is still only $30 from Amazon (full version, no upgrade, no subscription). But it’s also unfair to compare both these apps with one another as they target different audiences. $60 for Sketchbook Pro was always a bit much if you’re an occasional user, or if you only need the software for a single project. But with the new licensing scheme there really is no excuse not to try SketchBook Pro 7 – for a single project or a whole year. I’m just saying… would it kill them to give Sketchbook Pro 6 owners 50% off an annual subscription to Sketchbook Pro 7? You’d think previous owners of Sketchbook Pro 6 should get an incentive to upgrade by paying less. But that’s not what Autodesk think! 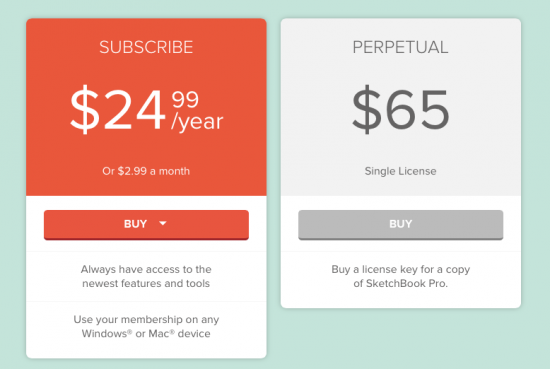 Starting February 2015 all “upgrade pricing” will be abolished in favour of subscriptions. If you decide to save a buck and purchase the perpetual upgrade license as they call it, you’re in for a surprise: this is a special version of Sketchbook Pro 7 which includes all Desktop Pro features and does not check your Sketchbook account for a membership. This special version has a field to enter a serial number instead of your account details. This is of course not important if you’re going to use the desktop version exclusively. Be aware however that a subscription brings other perks, such as cloud storage and – more importantly – unlock features in the upcoming mobile versions of Sketchbook for Android and iOS. The perpetual license will likely NOT UNLOCK those features, and it is unclear right now how Autodesk is going to charge for those. It is likely however that said mobile pro features are directly tied to a Sketchbook subscription. Since the pricing is the same, what’s the difference? Well as in previous versions, the Mac App Store version is another special version of Sketchbook Pro 7. You are charged via the Mac App Store, and your license will likely not work on a Windows machine. In theory such a subscription should register on your Sketchbook account, but early user reviews on the App Store indicate that this is not the case. Just a word of caution here: if you would like to use Sketchbook Pro 7 on both Mac and Windows DO NOT BUY THE MAC APP STORE VERSION. Let’s remember that owners of Sketchbook Pro 5 and 6 were bitten by the fact that upgrading to a new major release is impossible with the Mac App Store version as Apple don’t have a mechanism for that. Users who had bought the app from Amazon or Autodesk were eligible for upgrades, but Mac App Store users were not. See, it’s really not about the users here – it’s only about Autodesk and how best to extract money from us. I’d like to see at least a discount code for previous owners of Sketchbook Pro 6: give us 6 months free access, or give os 50% off an annual subscription for the first year. Anything to make us happy. But alas: Autodesk doesn’t really need happy customers as much as they need happy bank managers and shareholders. Enough said. You may have heard of SketchBook 2015 which was released a fees weeks ahead of 7. It was the same deal with SketchBook Pro 2011 vs 6. From what I understand they’re essentially the same product with the same features, the only difference is the licensing part. For Pro 2015 you don’t need individual accounts for every user. Instead an admin can “unlock” the software on 10 workstations for his employees. Pro 7 requires individual accounts for every user. Pro 2015 isn’t for the likes of you and me, and if you’re buying in excess of 10 licenses you’re probably better off taking to your Autodesk Account Manager. That’s exactly what I thought too! SketchBook Pro 6 still works fine for the occasional sketch I’m doing. The same goes for the iOS version. So Jay, I wonder, would a license be permanent? Because I don’t want to pay 65$ again in the future for the same thing. Thanks. yes it would be a permanent license for the current version of Sketchbook 7. You’ll be able to use it for as long as you can, provided you operating system supports it. However, when Autodesk release the next version (8 presumably) then you’ll need a new license. Subscribers will get the new version for free. It was the same for owners of Sketchbook Pro 6: I can still use that version until OS upgrades may some day prevent it from running. All the new service “model” amounts to is trying to control a piece of your computer which is why you bought a computer to begin with–to actually make it do something. Forget it, I will give money to open source before I drop one dime on Adobe, Autodesk, or any other foolish enough to move to becoming a tax collector. GIMP is a very capable program all considering, and has done better than many. At least open source developers actually take an interest in what they create without bending you over barrel. It’s more likely they’d create what people want if people would actually contribute to the cause instead of wishing for corporations to do the right thing. These companies have had it great for too long, they’ve already caused people to pay all out for every successive version every time some new feature is instituted, and sometimes that’s without fixing prior complaints! No way, I only bought one Autodesk product in my life and they squashed the product/project instantly, it was called Autodesk Animator Studio, yes that is many years ago, nevertheless that stuck with me because money doesn’t grow on trees and these companies don’t have any respect for that. It took them years before they could draw a smooth even line in Windows with a wacom tablet that looked natural without being jagged, crooked, slow or some kind of crap, and even still UNBELIEVABLY some of these guys still haven’t figured out just how to do that! Pathetic. We all wasted too many years dealing with buggy software non-stop, wasting more time typing in product keys, and now we have to waste even more time signing in every time we use it? You’ve got to be kidding me! Out of their bleeping minds! Not one more penny! It’s like your computer has been digitally handcuffed, you don’t own anything anymore! Stop consenting before it’s too late!